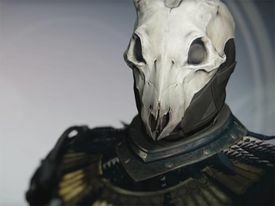 THE STAG is an exotic Warlock helmet introduced in The Taken King. Doe or Die: Super charges faster once per life when teammates are dead. May possibly respawn with overshield. Innervation: Bonus grenade energy from Orb pickup. Invigoration: Bonus melee energy from Orb pickups. Better Already: Shields recover immediately after Orb pickup. Infusion: Replenishes health with every Orb of Light pickup. Twist Fate: Changes available stats and upgrades. Inverse Shadow: Increased Super energy gained from killing enemies. Ashes to Assets: Bonus Super energy with grenade kills. Hands-On: Bonus Super energy from melee attacks. Second Thoughts: Bonus Super energy from Special Weapon kills. Heavy Lifting: Bonus Super energy from Heavy Weapon kills. "Only bones for your feast. Only death for my victory." Dearly Departed: Grants Rift energy when you are critically wounded. On your death, creates a brief healing rift on your corpse. Plasteel Enhancement Mod: Increased Resilience. Restorative Mod: Increased Health Recovery. In a distant life I knew fear. But bones cannot bleed. Your slings and arrows carve runes of power into my skull. I am prey no longer. I was your sacrifice. Your food, your harvest. You thought I would lie where I fell. But I am prey no longer. Now it is my turn to stalk you among the long shadows. To make your strength my own. To take all you hold dear. For I am prey no longer.